Optimal working dilutions should be determined experimentally by the investigator. Suggested starting dilutions are as follows: WB (1:500-1:2000), IF (1:200-1:1000), ELISA (1:40000). Not yet tested in other applications. Fig. 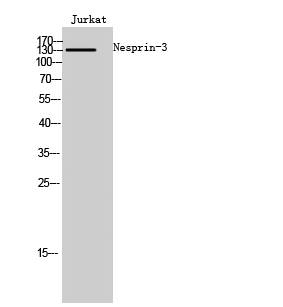 Western Blot analysis of Jurkat cells using Nesprin-3 Polyclonal Antibody. Component of SUN-protein-containing multivariate complexes also called LINC complexes which link the nucleoskeleton and cytoskeleton by providing versatile outer nuclear membrane attachment sites for cytoskeletal filaments. Involved in the maintenance of nuclear organization and structural integrity. Probable anchoring protein which tethers the nucleus to the cytoskeleton by binding PLEC which can associate with the intermediate filament system. Nesprin-3 Polyclonal Antibody detects endogenous levels of Nesprin-3 protein.